In Part 3 of our Motorsport Manager series we will look at races 6-8 in VivaRacing’s debut season. Team manager Alejandro Hurtado will be keen to push on after a promising couple of races for his team. If you missed the previous post, or indeed the last two, take a read of them both below. 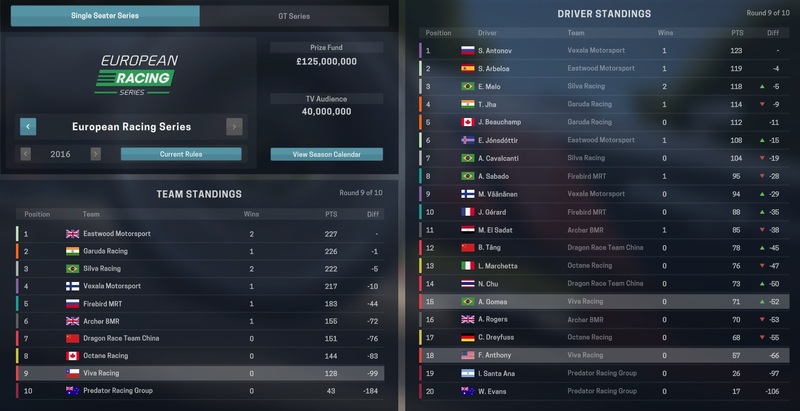 At the halfway mark in our first season with VivaRacing, the team are 8th in the team standings. If we can continue our form from the previous few races then further progress could be made towards moving up the table. Both Andre Gomes and Faith Anthony (and reserve Enano Ferreira) have contracts that expire at the end of the season. Though both main drivers are decent enough, neither have potential to grow. Moving forward we need drivers who can become world class if we are to make further progress. The need for improved scouting facilities is certain. At the moment there are no drivers better than Gomes and Anthony that would be interested in moving to us. Hopefully this situation will change as we approach the end of the season. 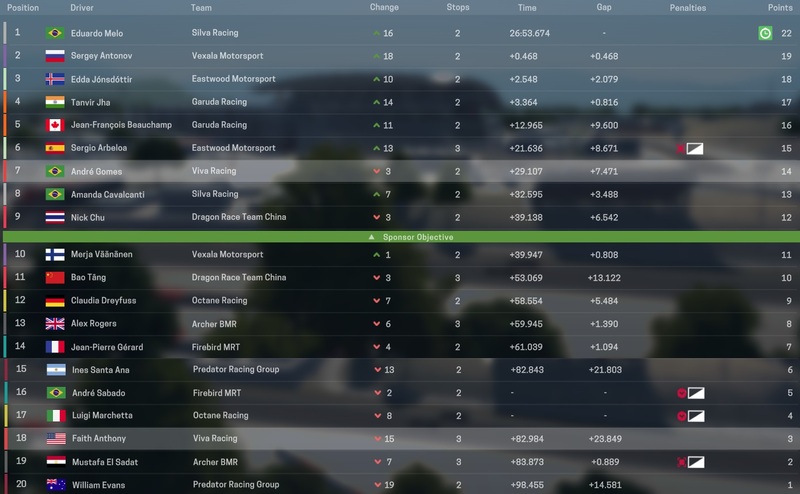 A poor race by both VivaRacing drivers saw them finish in 15th and 16th. The failings of the car were immediately noticeable as both drivers fell away at the beginning of the race, dropping from their high starting positions right to the back of the pack. Neither recovered and the promising signs from the previous races were quickly forgotten. Terrible luck befell VivaRacing in Race 7 of the European Racing Series as both drivers damaged their rear wings in a collision with another driver in the first lap. This setback meant that little chance of achieving a decent finish remained. Indeed, the drivers could only manage 16th and 18th between them. A much improved race for Andre Gomes saw him finish in 7th place. Faith Anthony, though, will be ruing her luck as for the second race in a row she lost her rear wing as a result of a collision. She could only muster an 18th place finish. After a poor few races, VivaRacing have dropped to 9th in the team standings. Despite this, there is no pressure on us to succeed as our chairman is only expecting a 10th place finish or higher. Alejandro Hurtado is not used to settling for a position and will be expecting to push on to finish as high as he can. With just two races left, can his team improve and move up the standings? Thanks for reading part 3 of this brand new series on VivaLaVidaFM. In bringing out a series on a new game it may take some time to find out what works when writing posts, so please do leave any feedback you have in the comments section below. Although our website predominantly publishes posts on Football Manager, I’m keen to introduce new content from other games too. 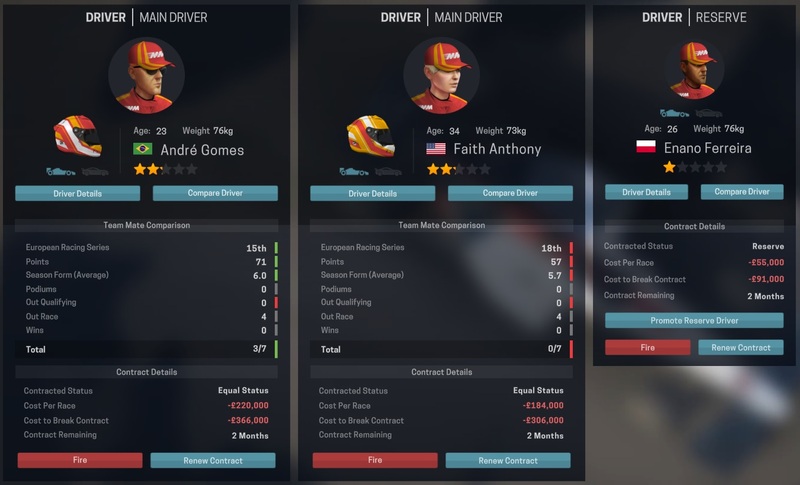 If you are interested in following this Motorsport Manager series then do follow the blog! 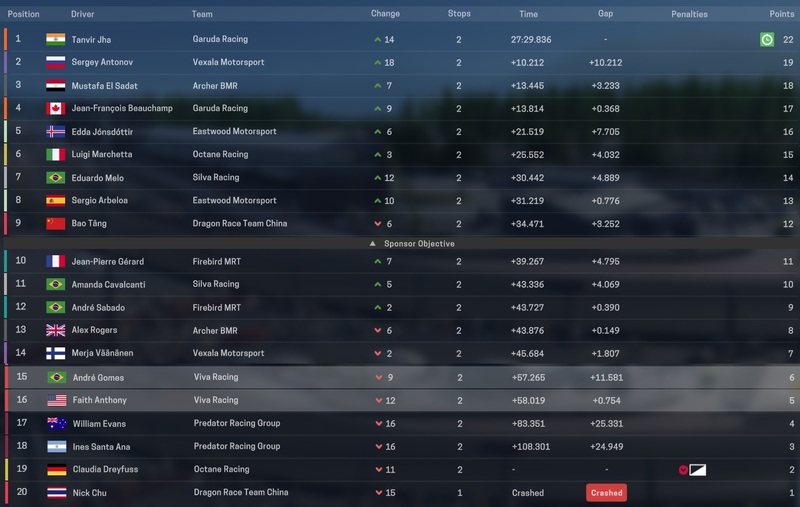 This entry was posted in Motorsport Manager and tagged alejandro hurtado, guildford gp, motor racing, Motorsport Manager, munich gp, tondela gp, vivaracing. Bookmark the permalink.